Mycra Pac Designer wear is sewn in the USA and now you can have your Mycra Pac Raincoat shipped to Australia. These beautiful, sought after raincoats can be purchased from Going In Style Travel Rain Coats & Gear and shipped overseas to the land down under. Going In Style ships your Mycra Pac Rain Coat USPS Priority Mail International. For more information on shipping your Mycra Pac Rain Coat to Australia visit our International Shipping page. The land of the long weekend is known for its laid back, relaxed atmosphere. When you travel to Australia you will get to see its beautiful, white, sandy, beaches and its unique, expansive outback landscape filled with blue skies and wildlife. And when you think of Australia who doesn't think of those cute, furry marsupials native to Australia; you can expect to see a Kangaroo or two whether in the wild or on your dinner plate. Because of the beautiful landscape Australians are very outdoorsy, likewise their fashion is chic, yet comfortable for the outdoor weather. With the Mycra Pac Coat you can look chic and feel comfortable all day with this great fashion coat that goes from day to night. The classic shape looks great over all your outfits, including trousers, faded denim jeans, or with your best Best Bib and Tucker. Mycra Pac raincoats have a sleek oversize hood that doubles as an accordion style collar that ads a polished styling detail. Pair your Mycra Pac jacket with cozy sherling boots for a high impact winter look. These coats come in a variety of punchy colors that can be reversed to be worn as a neutral hue. The Mycra Pac coat is a wardrobe classic that will be in style for years to come. 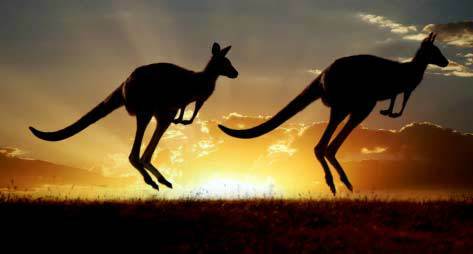 Australia is located in Oceania, and is the continent between the Indian Ocean and the South Pacific Ocean. Australia has a lot of desert land also known as the outback. Australia includes Lord Howe Island and Macquarie Island. New Zealand is a neighboring country. Australia is the smallest continent, yet it is the sixth largest country in the world. Australia is the only continent without glaciers. Most of the population of Australia is concentrated along the eastern and southeastern coasts. This travel coat also makes a great prezzy for a friend or sister. Australia's climate is generally arid and dry. Australia is a large country and climate varies by region. The climate is temperate and pleasant in the south and east parts and tropical in the north part of Australia. The northern states are typically warm all the time while the southern states have cold winters. One of the most consistent winds in the world is called the Fremantle Doctor, it is an invigorating sea breeze that affects the city of Perth on the west coast. Rainfall in Australia is greatly concentrated along the north coast and the east coast of the country. Darwin, Australia gets 14 inches of rain, or 358 mm, in the rainy month of February. The island state of Tasmania also receives quite a bit of rain. When considering your trip to Australia, you will have plenty of International Airports to choose from including Sydney, Melbourne, Darwin and Perth airports. Australia is highly dependent on road transportation, so perhaps grabbing a cab or renting a vehicle is the most simple solution for transportation. Public transportation is also available. Australia has an inexpensive and extensive bus system in place for traveling Australia, however there are a few small cities and towns that the buses to not travel . If you are traveling long distant through Australia, the train is a fast mode of transportation, yet it is more expensive than bus.